How about a nice cup of tea or tisane? What is tisane? Simply another word for hebal tea. Calorie-free and caffeine-free, these drinks became popular before black tea became available as a luxury import. To make a tisane, use the infusion method. I love lavender tisane. Easy to make, refreshing and relaxing, drinking lavender tisane brings me a taste of summer whenever and wherever I want it! I go out to my garden and pick some fresh lavender. Clean it, wash it, chop it and place the mixture into my tea ball. I cover the tea ball with boiling water and wait for the water to become infused with the floral scent of lavender. 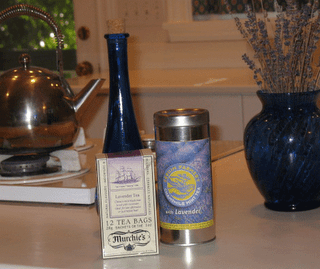 Drink your lavender tisane with honey or with out, hot or cold. When I don’t want to make up my own tisane, two of my favorite beverages are: Sequim Farmers’ Chamomile & Mint Tea with Lavender (available from www.bluemoonlavender.com) and Lavender Tea offered by Murchie’s Tea and Coffee (note, this is a caffeinated tea using China’s mild black teas laced with lavender. For the last month, I have craved scones. Every morning, I justify my indulgence for a scone and latte by a long and vigorous walk directly to my favorite coffee shop. A warm, sunny autumn provides the perfect weather for my morning outing. Today, I decided it was time to make my own scones. I tried two recipes: Ginger scones from Nancy Silverton’s Pastries (from the La Brea Bakery )and Lemon Lavender Scones, a recipe from Denise Kitchel. I added lavender to the Ginger Scones just for the fun of it! 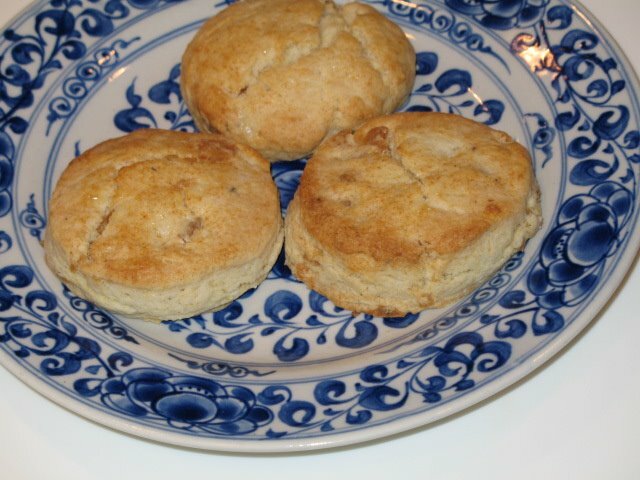 Nancy Silverton’s Ginger Scones are FANTASTIC! With 6 ounces of butter and 3/4 cup heavy cream, the taste was rich and reminded me of a butter cookie. The ginger gives the pastry a little zing! The recipe makes 9 very large scones. 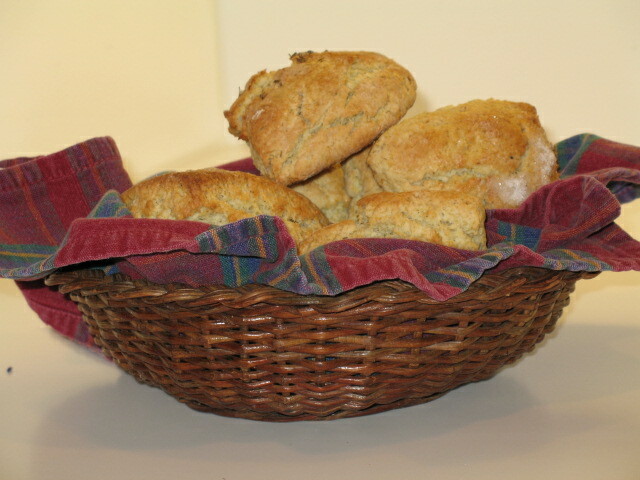 The Lemon Lavender Scones were also delicious. Lemon and lavender seem to compliment one another. This recipe calls for two eggs plus butter and cream! What’s not to like? Preheat oven to 425 degrees Farenheit. In a bowl whisk together flour, baking powder, sugar, salt, lemon zest and lavender. Add butter pieces and cut in with pastry blender or using your fingers until most of the butter looks like oatmeal, with a few pieces the size of small peas. In antoehr bowl lightly beat eggs and cream iwth a fork just unitl combined. Add the eggs and cream to the flou mixture and stir just unitl combined. Knead gently until dough comes together into a ball . Cut the dough in half and shape each piece into a ball on a floured board. Flatten the balls with palm of your hand until about an inch to an inch and a half thick. Cut each piece into four wedges. 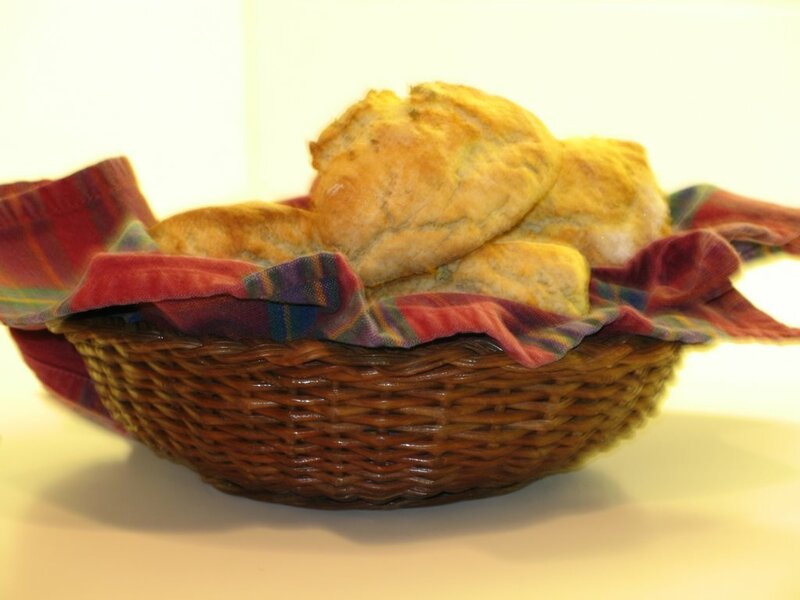 Place scones onto a parchment lined baking sheet. Brush the tops with cream, and sprinkle with lavender sugar. Herbal tea, vibrant and refreshing, replenishes my spirit and delights my taste buds. 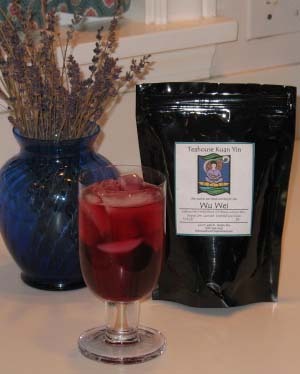 The Wu wei blend was created by a Seattle Teahouse in our Wallingford area –Teahouse Kuan Yin. Drink it for its beauty; the color is like a ruby. Also, the taste delights. Hibiscus, lemon balm, orange peel, lavender buds and cloves blend and offer a tastes from the garden. Drink it cold on a hot afternoon if you please. The temperature in Seattle reached 80 plus today, so the iced tea was a perfect afternoon delight. The helpful young gentleman at the Teahouse Kuan Yin said the tea is also good served hot! The name of this blend is Wu Wei, meaning “effortless doing”. I purchased 1/4 pound of Wu Wei for a personal treat. After brewing a tall glass of Wu Wei in my kitchen, I felt refreshed with a sense of renewed energy. Delicious!